For sixty minutes, Satori Junk take us on a journey beyond walls of safety, towards most horrific landscapes. This is some psychedelic trip (I told you to mind the cover artwork! ), mingling Stoner and Doom elements with a huge dose of drug-infused Sixties / Seventies attitude. It actually starts with the weird intro, which is like a spoken presentation of the terror that we’ll meet during this hour of sonic discomfort. The whole experience twists, confuses, flies straight-forward and turns around, and back, balancing in between calmer, mesmerizing parts and massive, colossal excerpts. There is no fear to enter side-worlds of Groove and Blues, even though these aspects are, in a sporadically used presence, inferior to the pounding and pushing heaviness. The use of Theremin strengthens the trippy, spacy atmosphere, and the brute, monumental repetitive riffs and rhythms bring the listener into an unearthly trance. Cool are the few ethereal fragments, based on gloomy synths (sometimes mingled with fine yet simple percussion, such as bells / chimes / triangle, like on the songs’ outros). It’s fuzzy, distorted and even ironic in a cynical way. The voice of Luca (Luke, if you want) is little yammering and whining, but this does not need to be something negative at all. On the contrary, it fits very well to the Doom epic and atmosphere of the band. The vocals, however, are quite limited, for the focus lies on the instrumentation especially. Besides, these vocals aren’t mixed to evidently to the foreground; on the contrary, their presence is equal to the guitar leads and rhythm section. Which brings me to the sound quality, which is, to my opinion, quite okay. The equilibrium after the mix creates an equally segmented aural presence for all things involved, whether it concerns a leading piece or a supportive one. Fine is the rough guitar sound, for the melodic riffs are the basement that carries the whole thing. Remarkable, yet not that unexpected or bizarre, is the cover track Light My Fire from The Doors. I do have a love-it-or-hate-it affair with that (legendary) band, for some of their songs I adore, and some I simply detest. This specific track, and then I am referring to the original one, accidently falls in between both. 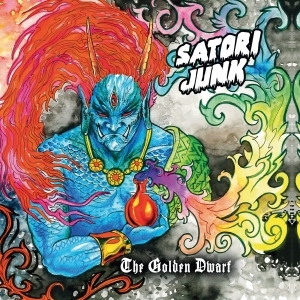 However, the cover version of Satori Junk is quite insolent, and that’s just great. The band created a cool remake of this well-known song, once again adding a very personal, own-faced twist in the completion.